UPDATE: So sorry folks, we don't mean to cry wolf, but upon closer inspection we believe that this prototype is actually a revised F34 3 Series GT (Gran Touring). With some of its rear camouflage removed, it revealed a sleeker hind roofline and revised rear, which gave it the appearance of a fastback/coupe-sedan, which we mistook for the 4 Series Gran Coupe. We apologize for the mistake. The silver lining is that the 3 Series GT is looking sleeker/sportier than ever. UPDATE 2: We've been looking at these spyshots for a couple of hours and compared them to previous 3 GT spyshots. As it turns out, this mule is different from earlier mules. The boot is a bit longer and seems to miss the retractable rear wing spoiler. The shape of the rear doors and rear side windows is very similar, yet not identical to earlier 3GT prototypes. The car appears to be sleeker and longer. 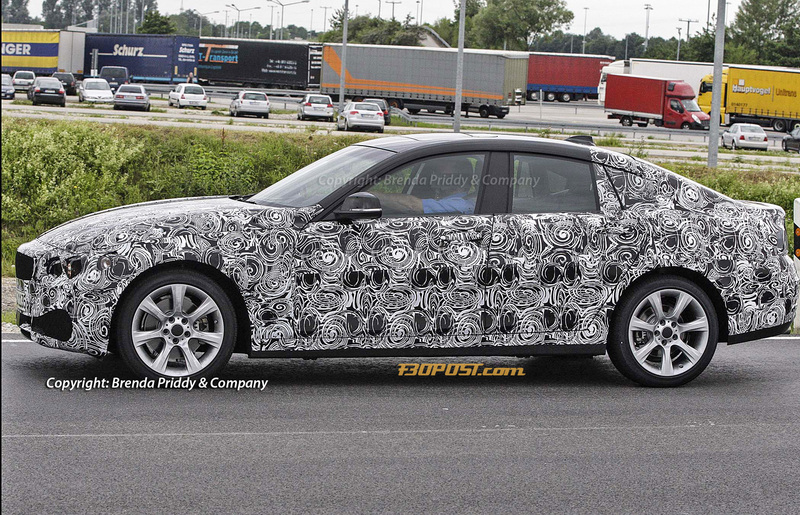 That being said, we still don't think it's a 4 Gran Coupe for several reasons: This mule clearly is a hatchback and has a small third side window right behind the C-pillar. The ride height is too high, even for a 4-door coupe. This leaves us with two explanations possible. Either BMW has reworked the 3 GT which wouldn't be a first as the same happened to the 5-Series GT which started as the infamous RFK concept, or we're looking at a LWB 3-series GT. 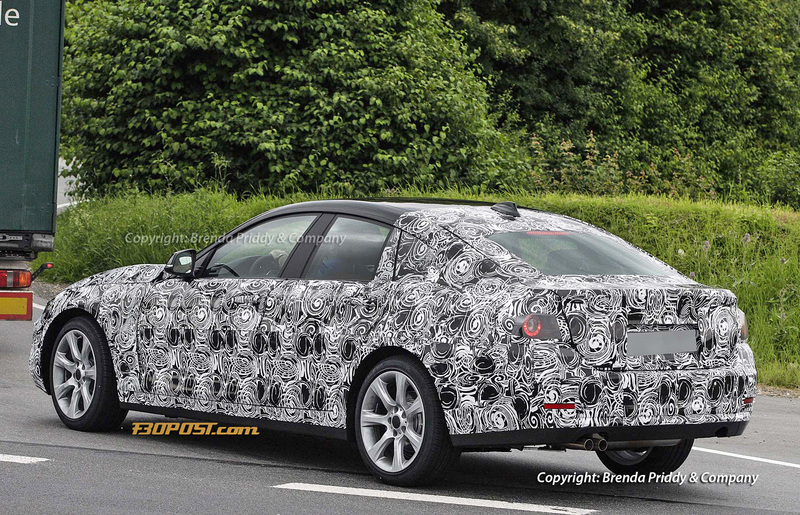 Again, whatever it is, it's most likely not the 4-series Gran Coupe. UPDATE 3: Our resident insider Scott has now confirmed that it's actually the 3-series GT we're looking at. BMW hasn't revised the car but chose a very clever and tricky camouflage on earlier test mules. Here's his full explanation: "It was perspex see-thru panels that was then layered with the camouflge sheets, the more 5er GT rear end was a vacumed plastic mold applied to the rear of the car and shrunk round the rear body before being covered in layers of BMW's patented camouflage , The rear shot shows the bulked out sides as does a previous shot where the tailgate is open and the panel overhangs from the edges. The car has not been redesigned as it is too late to make any sheet-metal changes. It is very much indication of what you will get from BMW prototypes from now-on , even some use cannibalized parts from existing prototypes before they are destroyed like every BMW prototype including FEP cars. The final 3er GT looks very much like this." Why is the b-pillar that thick? That area looks production ready and not camouflaged, seems like a pretty bad blind spot. Looks like a sedan to me. 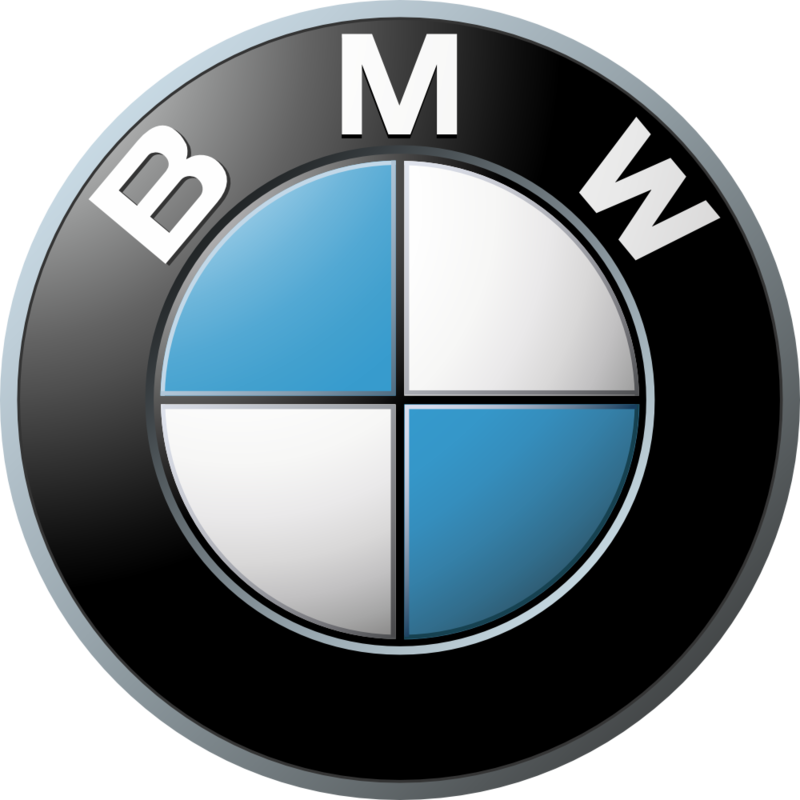 What is BMW thinking. Looks like a cross between an Accord crosstour and a an outback. I think it's a) because the doors will have frameless windows and b) to add torsional rigidity to the body. From a driver's perspective, I doubt the thickness of the B pillars will have much effect on the line of sight. Can't wait! The 6 Gran Coupe is a stunner so I have high hopes for this car! MB does frameless windows on many of their cars without such a thick b-pillar. Having driven a few rental sedans with thick b-pillars, I find it to be a terrible blind spot, as it's right where I look when looking over my shoulder. Regardless, this whole class of car, CLS, A7, A5 Sportback is generally pretty ugly in my opinon, the 6 GT being the first car in the class that I like (at least in pictures, I haven't seen one in person yet). You mean 6 series gran coupe? I think you mean F32 coupe..
What about the 3GT ? This is one of the dumbest things I have ever seen. The 4 series is dumb enough now a gran coupe version it's just a 3 series sedan with a jacked up price! I'm thinking the same. I am starting to need an extra set of doors. Doesn't look terribly appealing in this guise, but I can use my imagination. I could believe that an ///M version (F86?) could debut in 2015 or early 2016 after the F82 ///M4 coupe. It could also incorporate any LCI changes that the F3x series should get around that time. Also, a MY2016 M-version could be a good excuse to update front/rear LEDs, something that could be shared with the M4 coupe. Kind of like how the E92/E93s got better headlights than the sedans in the last few years of their life. Well this confirms the "4 series" including the separation of the M3 and now new M4. The question now is will the F series M3 ever be a coupe? Still coming. Forgot it on the list above, but added now. There won't be both an M4 coupe and M3 coupe. The 3 Series coupe will now be called the "4 Series," so the M3 coupe will now be called the "M4." The only reason this doesn't happen is if the BMW board decides to break with its naming convention and make an surprising exception in naming the upcoming F82 as the M3 coupe (instead of "M4").